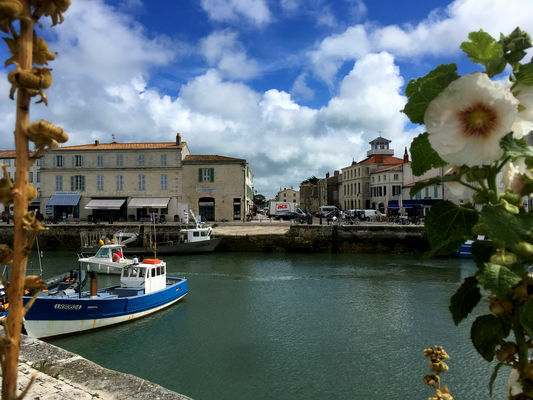 Let’s explore the various faces of the village of Saint-Martin-de-Ré, its harbour with its 2 docks, and the typical narrow streets steeped with history. 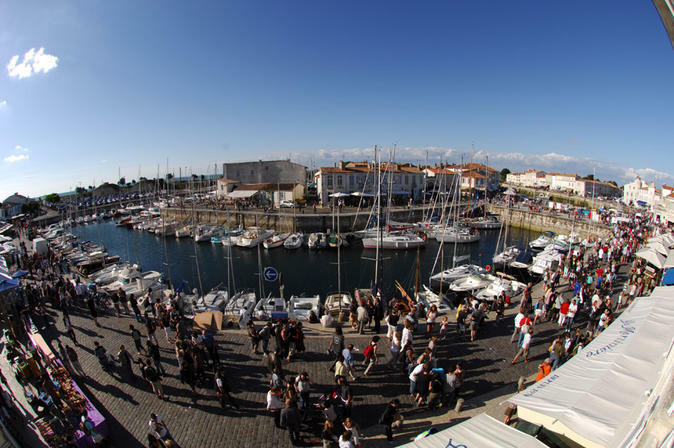 Let’s discover this exceptional heritage thanks to the circuit “Walking Saint-Martin-de-Ré” (approx. 1h30) with tour of Vauban’s fortifications. You have now reached Saint-Martin Tourist Office. Set out for the village designed by Vauban. At different points of the route you will come upon an asterisk * which means that the words or expressions will be defined under the heading “Tip”. Now, let’s go! Monks developed the island’s first economy by planting grapevines in the 12th and 13th centuries. Today 650 hectares of vineyards produce 30 to 35 hectolitres of wine per hectare, that is to say about 2 million bottles per year. Salt was also one the exported riches. Up to 30,000 tonnes of “white gold” were harvested at the beginning of last century. Today, the marina comprises 2 docks: the first one directly linked to the sea and the second one – a wet dock- filled with water 24 hours a day. It can accommodate over 200 boats. A convict* was a prisoner detained in the citadel of Saint-Martin-de-Ré between 1873 and 1938. He painted this map whilst in was in detention. Convicts (prisoners) were sent from the harbour of Saint-Martin to New Caledonia and Guyana. 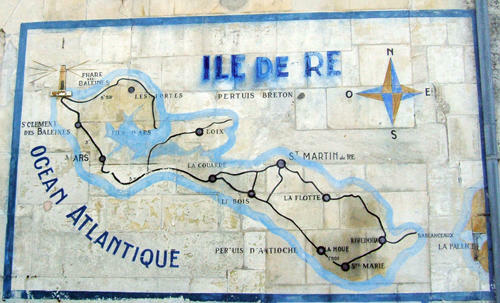 Île de Ré is 31km long and 5km wide (the narrowest part: 70m). It comprises 10 villages and Saint-Martin-de-Ré is its historic capital. * Tip: A convict is a man sentenced to galleys or hard labour in penal colonies, a prisoner. 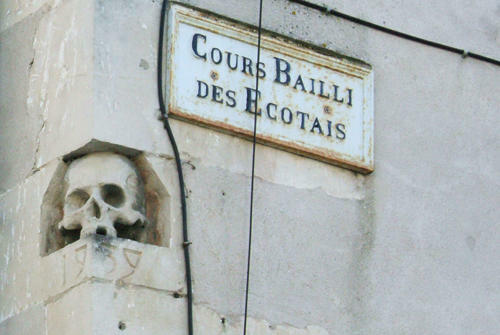 The skull was sculpted by M. Thézard in order to express his discontentment and hatred of World War Two and its atrocities. We don’t know exactly when the church was built. We only know that in 1610 it was already in ruins. The church was destroyed several times over centuries. 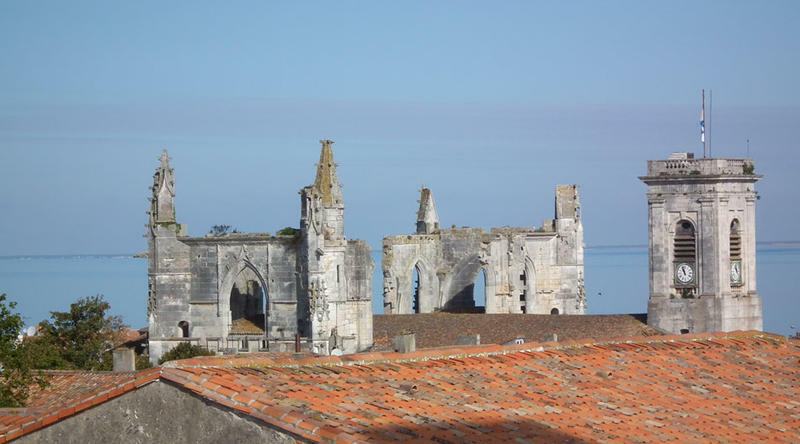 First, in 1627, when the town was besieged by the English forces, Maréchal de Thoiras (Île de Ré’s defender) commanded his troops to demolish the steeples of the church in order to prevent the enemy from installing their cannons… In 1696, the Dutch forces launched over 3,000 bombs in the direction of Saint-Martin, and consequently destroy over 300 houses and the church. In 1694, a fire started and the framework and the choir* were completely destroyed. In spite of the numerous damages, the inhabitants will inexorably try to rebuild and renovate what remains the only Catholic place of worship today. * Tip: In architecture, the choir, from Greek, khoros, meaning a group of singers, is the area of a church where clergy and members of the liturgical or Gregorian choir may stand either in a cathedral or in a church. This square was built by Vauban in 1685 and replaces the former Catholic cemetery. At that time, this place occupied a strategic position since it was equidistant from the harbour and the two gates to the town (Porte des Campani and Porte de Thoiras). In case of an attack, it permitted the quick deployment of soldiers. It was named successively ‘Place d’Armes’, ‘Place Louis XIV’, ‘Place Louis XV’, ‘Place Nationale’ and finally ‘Place de la République’. If you have some energy left, continue and follow Rue Carnot and then Rue Aristide Briand which will lead you to the next monument. In front of you stands this large stone gate at the entrance to Rue du Rempart. The similar gate named ‘Porte de Toiras’ is to be found at the other side of Saint-Marin-de-Ré. These 17th century vestiges were the only two gates to the town: these gates could be closed just as it was the case in a fortified castle, and the population was therefore protected within the old town surrounded by fortifications. Now take Cours Pasteur and walk down to the harbour. You can cross the road but be very careful with cars. You will discover the fortifications providing spectacular views of the ditches! To the right you will see a hotel and facing it a secret passage which is called a Postern*. It will lead you to the heart of the ramparts, in a peaceful location, and you will be able to admire the dimensions of these buildings. * Tip: A postern is a small doorway which was hidden and built into the rampart of a fortification and was intended to help the inhabitants of the castle to come and go inconspicuously. Imagine that 12km of walls surround the town and that in the 17th century there were not any machine and concrete to build all that. Workers had constructed and stuck the stones together with whitewash (a natural concrete at that time). The main components of this natural glue was wood which was brought from Poitou forests, limestones which were extracted from Taillebourg quarries and transported by boats and animals, and the absolute necessary fuel – coal – which was imported from England even though this country was our great rival at that time. It’s time now to rest or walk back down to the harbour following Cours Pasteur. The former building was a place of worship but was razed to the ground shortly after the Revocation of the Edict of Nantes* (1685). After two centuries of negotiations between the hospice (the building’s administrator) and the town authorities, an agreement was reached and the town authorities became the only owner of the market. The covered market has therefore been built on the former Protestant temple which had been demolished after the Revocation of the Edict of Nantes (1685). * Tip: 1685, Revocation of the Edict of Nantes: according to this edict, Louis XIV promulgated that the only authorized religion in France was the Catholic religion. This was a terrible blow to the Protestant minority in spite of the fact that French Protestants has previously experienced harassment and persecution. For further details, visit Tourist Office!